Starting your own inflatable rental business can be very exciting, but it can also be stressful if you don’t do your research. With the proper guidance, you can be well on your way to a profitable business venture. 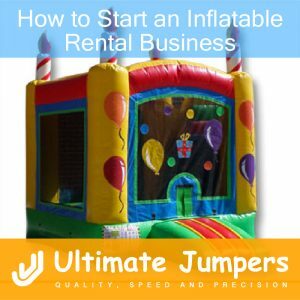 The following tips will help you understand how to start an inflatable rental business. Inflatable Rental Business Name and License: Once you come up with a proper name for your inflatable rental business, you need to obtain a business license. You will also need to decide where your business will be located. For example, you may decide to work from a home office while storing the inflatable units in a garage to keep your initial business costs to a minimum. Research the Competition: Get to know the other inflatable rental businesses in your local area. Get familiar with their products, their websites, and their pricing policies. This will help you to decide the prices for your own company, as well as the products you offer. Prepare for Launch: Many factors go into launching a business, such as obtaining a phone line, marketing, and finances. You will need branding for your inflatable rental business that will help costumers recognize your company on business cards, flyers, and websites. In addition, it is important to prepare a professional rental agreement. Make sure you have a proper system to answer customers’ questions, return phone calls, and receive messages. In addition, make sure the website clearly lists all products and services available. Inventory: When you make an initial investment in your inflatable units, it is important to ensure they are of good quality. The last thing you need is a poor quality inflatable that will break down quickly. A great option to look into is financing for purchasing an inflatable unit. For example, UltimateJumpers.com offers financing options for start up companies. Check out their awesome financing options here. With the proper information, you are well on your way to understanding how to start an inflatable rental business.